Brioche is one of those crowd pleasers that you can eat for breakfast or a snack during the day. 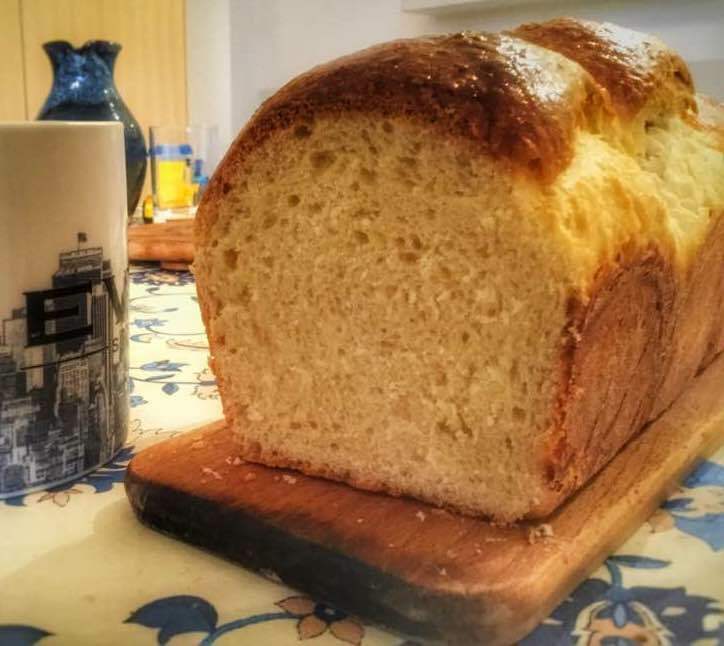 It’s, technically, a raised enriched bread: in addition to flour and yeast, the dough contains eggs and butter (the recipe I use, which I adapted from Un Déjeuner de Soleil, has 125g butter for 250g of flour, but richer ones have even more butter). The key to its lovely taste is three rises: one short one at room temperature, one long one in the fridge, and a proofing one in a warm oven. This recipe can be mixed by hand or in a food processor: the food processor is the only way you’ll get the long strands of dough that are characteristics of the machine-made version (I hate doing the food processor thing, so the version here is by hand, but your mileage may vary!). If the dough becomes intractable or too greasy, stop, chill in the fridge and start again. If it keeps being too sticky *after* kneading, add a little more flour. You’ll need to be able to do stretch-and-folds: technique is here. Also able to shape the dough into a round: see here. If using active dry yeast, re-activate the dry yeast in a few spoonfuls of 38°C water. Wait 10 minutes. Mix the salt, flour, sugar and yeast (start with the salt to make sure it's well spread through the flour before adding the yeast). Add the eggs a few spoonfuls at a time, making sure they're well incorporated. Then add the butter in 6-7 chunks--same, make sure it's well incorporated in the dough before continuing. Do five stretch and folds on the counter at five-minutes intervals to give the dough some shape. 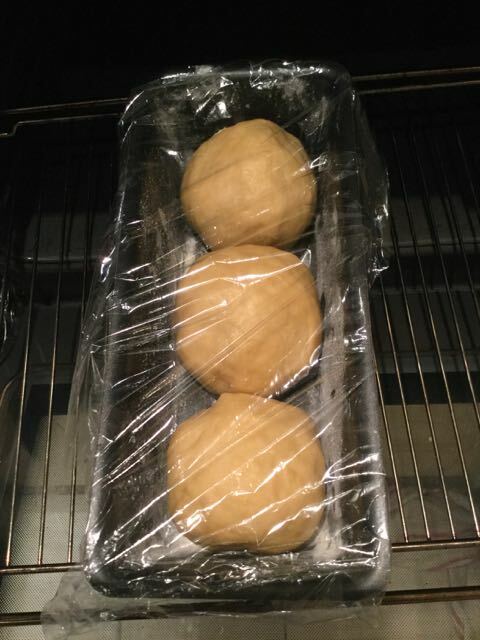 Then start the room temperature rest: put the ball of dough under a salad bowl and leave it for a bit. Every half-hour, give the dough another stretch and fold, and cover again with the salad bowl. Get a clean salad bowl (or clean the previously used one). Oil it, then shape the dough into a round. Cover with cling film or a food-grade plastic bag, stick into the fridge, and leave to rest for at least 15 hours. 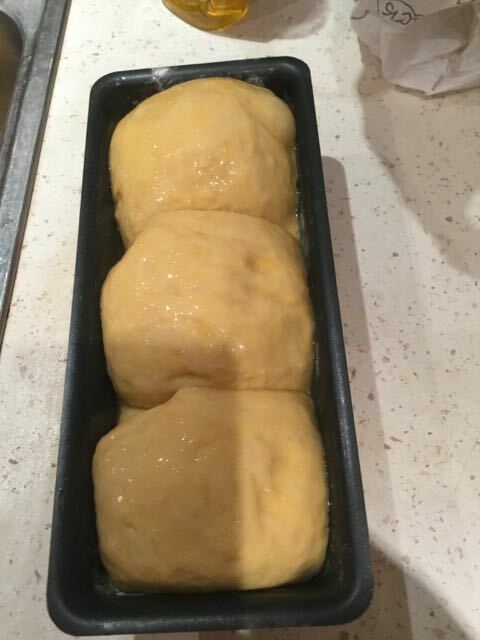 Get the dough out. Butter and flour the inside of a rectangular mould. Shape it into three balls. Leave to rest in a warm place (like an oven that's just been turned off--just remember yeast dies above 60°C so by "warm" I mean more like 25°-27°C) until doubled in size. Given that the dough is cold this actually takes 3-4 hours. See attached picture for an idea of what it looks like. When the oven is warm, stick the mould in it. 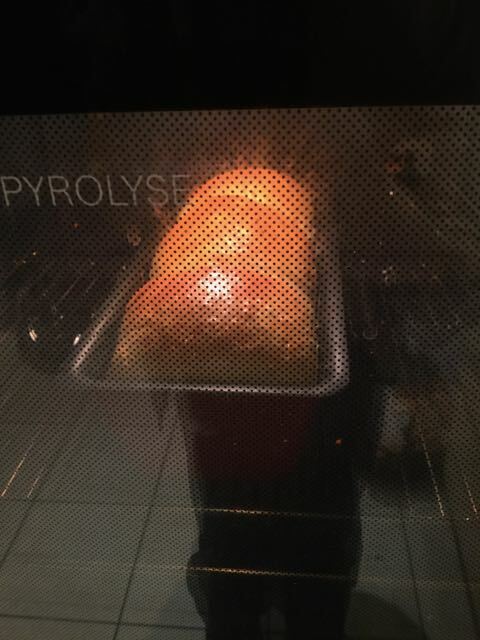 Cook for 20-30 minutes, until golden and risen. 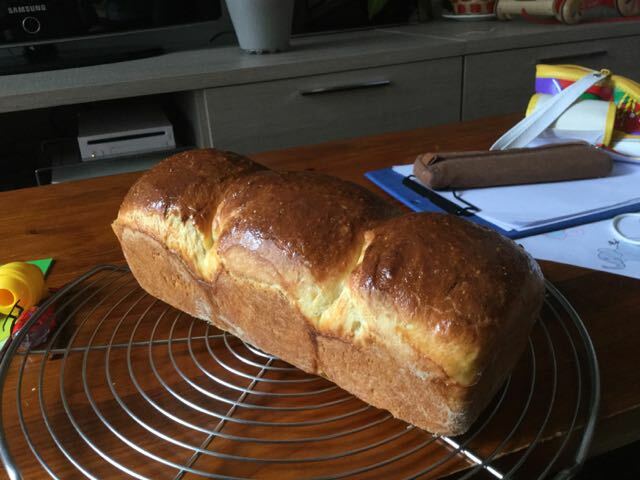 Take the brioche out of the mould and leave it to cool on a wire rack. And on the wire rack! Note: you can turn this into a chocolate brioche by adding 125g of chocolate chips just before putting the dough in the oiled bowl. Lay the dough flat on the counter, scatter the chips into it, and knead briefly to disperse. Then follow the recipe as written.